There are various forms of exercise and walking is one of the ways you can be healthy - mind, body and soul. I love to walk. Walking is simple. A daily walk is one of the ingredients in my happy, simple life recipe. For 18 years, I've seen my elderly neighbor walk every single day. And it doesn't matter if she's walking by herself in the winter, spring, summer or fall. Unlike my elderly neighbor, I usually walk with my husband or my friend. It's a time for us to catch up on the kids, families, work and our new adventures. I also enjoy seeing the beauty of nature. It has a calming effect. It's part of the routine, too, to say "Good Morning" to these 2 elderly men who walk the same path as I do. 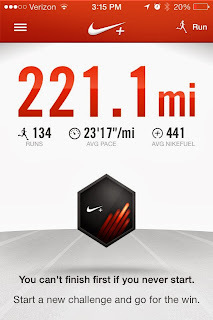 What keeps me motivated is tracking down the number of miles I walk every day. Nike+ has a free iPhone apps that I use every time I go out for a walk. My husband actually teases me because I get upset when I forget to turn on the apps because I believe that if I don't record the mileage, the walk never actually happened. How about you, do you enjoy a quick zenwalk in the neighborhood?